Paris - As the bodies of several passengers who were aboard an Air France plane which crashed into the Atlantic Ocean on its way from Rio de Janeiro to Paris last week were recovered over the weekend, the Jewish community in the French town of Boulogne-Billancourt began a halachic debate over the fate of one of its member, who is believed to have died in the crash. The debate was sparked ahead of a memorial ceremony held by the family of Shlomo Anidjar, who was aboard the missing plane, and focused on determining his wife’s personal status. During the ceremony, held at Paris’ Great Synagogue, Anidjar’s children asked to cite the Kaddish Yatom prayer (“orphan’s Kaddish”) for their father, and undertook mourning customs – together with their mother. France’s rabbis objected to these signs of mourning expressed soon after the plane went missing, even before the plane’s debris or passengers’ bodies were recovered, and threatened to boycott the ceremony. The rabbis expressed their fear that taking part in the memorial would be perceived as a rabbinical-halachic approval that the woman is a widow, while she is in fact considered an aguna (abandoned wife). Following the disagreement, Rabbi Yirmiyahu Menachem Cohen, a senior member of the Rabbinical Center of Europe, decided to convene Paris’ rabbinical court to discuss the matter. The judges rules that before undertaking the mourning customs the family should have ensured that the chances of finding survivors were down to zero, but that in this case, retroactively, mourning could be allowed. The court based its ruling on the initial opinion of aviation experts, who ruled that the plane had exploded in the air after measuring the radius where the plane’s debris were found. The halachic ruling also relied on a response written in the past by Rabbi Ovadia Yosed in regards to a combat pilot whose plane was hit by a missile and fell into the sea. Rabbi Yosed had said at the time that the explosion of a plane and drowning in the sea were two scenarios which a person could scarcely escape from alive, and that joined together, there was a halachic foundation to release the wife from her aguna status. According to this precedent, the judges ruled that the woman and her children could undertake the mourning customs, as the woman was expected to be recognized as widow in the future. They stressed, however, that she would not be allowed to remarry before a thorough discussion was held on her personal status. Is he dead or isn't he dead, that is the question. It cant be both. 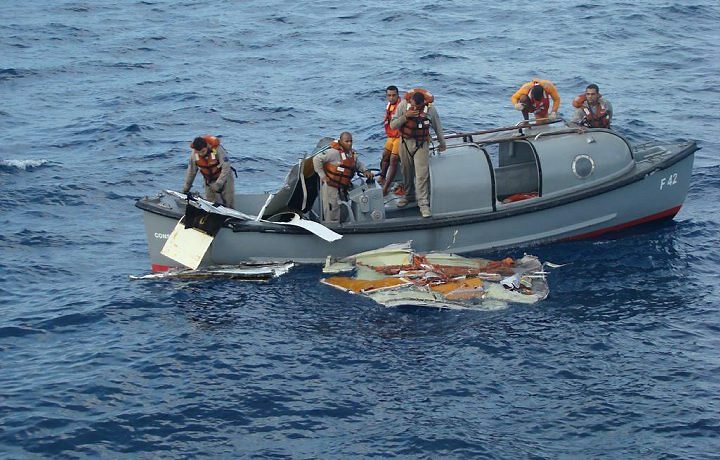 The France flight 447 was a tragedy already! It's magnitude is compounded by the fact that there were Jews aboard. Truly Tragic! Hashem, we understand this is Your will. We know You will protect the widow and orphans. We love You and want to be with You. I hope yhey find his body & he recieves a kevuras yisroel. Remember this has thecomplications of mayim shein lohem sof, however if the plane actually exploded in mid aie. I guess as a loshon hora blogger I am no posek anyway. Let's get it right. "Agunah" does not mean abandoned - it means chained. Abandonment is an act of the husband. To be chained is an act of the Rabbis. It's very easy to be a machmir. Let's see the Rabbis show some rachmanus for the living. Its very rasy for you to make stupid comments. There hundreds of teshuvos dealing with agunos from WW II and subsequent. Rabbonim look for heterim, but it is not an isse of being machmir or not. People, there are Rabbonim and Dayonim involved here. Let them with their Da'as Torah bring forth their p'sak. Let's not try to speculate in this regard. The Rabbonim Shlit"a are B"H very competent and knowledgeable in the Halochos and their intricacies. This has been a great loss for the family, the community and klal yisroel, please let's not compound the pain with our uneducated speculations. They should declare him dead because the bodies that they did find were in such bad condition that they do not want to describe even on the internet or in the newspapers!! They could have been shark bait!! Do you expect to find them then?? Debate? Quick, someone give them a newspaper to read. IT is a terrible tragedy that all those people died. They should not compound the problem for her and make this into a an additional pain. Why don't they decide the question we all see every day. How about all those bums who refuse to give their wives divorces? Those guys usually are holding out, just to be offered money by the wife's family and that is not a Torah reason. Also, some of them can't deal with the fact that treated their wives like garbage and now suddenly they want to treat them like queens. No, no, very often these guys want to get together again for the main purpose of revenge. "How dare you want to leave me, a big and wonderful tzadik like me; I'm going to now make your life miserable for shaming me in the eyes of the community." Why don't the rabbis want to deal with that huge controversy???? Airport Security cameras, as far as I understand, does not suffice as a 'witness'. Think of photoshop. One the up side, there are today, perhaps more then ever before in Jewish history, a huge amount su't on this issue because of WWII. They are recovering bodies daily now. She's not ready to get remarried. It's all a moot point for now. Be mispallel that they find his body fast. Preventing a situation in which the wife will be assumed to be a widow is more important. No, it's not easy to be machmir. It would be very easy and tempting to be mekil, but on what authority could they do that? If his death is not certain, how can they possibly allow her to marry? She's an eshes ish! Seriously, have you never heard of "we don't know"? Have you never heard of an agunah? If there really is camera footage of the boarding gate, the technicians in charge could testify to its provenance. And of course the same footage that showed him embarking would also NOT show him debarking; so long as it's clear that nothing has been removed from it, that should be enough evidence. Its true that the Rabbonim try to look for Heterim is such cases. Bu if you look at the Responsa after WWII you will see that very very few Rabbonim have the 'Wide Shoulders' to really be Matir. It takes a real Godol with a great heart to take it on his responsibility for a Heter. Even the last case in Mumbai proved this 'tragic' situation in the Rabbonim circles.Only Rav Wosner had the power and courage to be Matir the Agunah. The others seem to evade taking a positive stand on such matters. We are missing the greetnss and leadership in todays Rabbonim. “ Debate? Quick, someone give them a newspaper to read. You speak as if agunah were some modern invention. It's been part of halacha for 3300 years; if we can't prove that the husband is dead then he must be presumed to still be alive. If there is proof that he did board the plane, and didn't get off before takeoff, and that there couldn't possibly be any survivors, then the beis din will permit her to remarry; otherwise they can't. And a woman whose husband is available, and willing to give a get in return for money, is NOT an agunah. If she wants the get so much, let her pay, just as in the reverse case where he's the one who wants the get he has to pay. In the majority of cases there are no grounds to force a get, so both sides are entitled to hold out for whatever they want. Wow. I'm shocked Milhouse didn't have something nasty to say about Comment 2 - apparently this crash might actually be considered a tragedy even in his always correct mind. Do not confuse Halacha and rachmonus. The Rabbis have to pasken whether she is an Aguna or not based on many details and factors. And it has nothing to do with rachmonus, which does not dictate Halacha. Rachmonus will be shown by taking care of the aguna and the yesomim. The Rabbonim had the same issues after the Holocaust, and even after the most recent 9/11. Of course the Rabbonim are human, and have rachmonus, by nature, But that does not dictate the psak. To think the way you wrote (I assume that you were not castigating the Rabbonim, but talking out of sympathy) would be non-orthodox and incorrect. An aircraft crashing (C"V) at 200 mph into the ocean would hit with a deceleration of approximately 180Gs over 50 milliseconds. Safety regulations allow a deceleration of 20 Gs over 10 milliseconds for crash safety to protect against brain and aortic injury (which incidentally is much more than astronauts take during launching). I'd hope that this simple bit of math would help the rabbis pasken that assuming the poor husband was on the plane, he passed away instantly at impact. “ Thank you, Erwin Schrödinger. Not bad, Millie, but Schrodinger would hold that he was both alive and dead at the same time. (Sorry, no umlaut on my keyboard). As you must have expected, you sure got people upset with this comment. For the record, however, I agree with you. The fact that the rabbis would even consider making this woman an aguna under these circumstances is shocking. A yashar koach to Milhouse (#21) for correctly exposing the fraud of most of the so-called "agunos" today. Just because a woman is involved in a nasty divorce conflict in no way confers on her the status of "agunah". If a wife has been mosering her husband in non-Jewish courts, a typical situation nowadays, she is most likely a "moredes" and certainly not an "agunah". The word "moredes" seems to be a banned word in the vocabulary of the politically correct "agunot" activists. The true facts of the so-called "agunot" problem are simply too painful and inconvenient to be discussed by Mr. Avrohom Abba (#12) and his feminist fellow travelers. In many cases of so-called "agunot", the husbands are not asking for ANY money for a GET, but they are asking to be reimbursed for the legitimate damages they have suffered while being mosered for years in non-Jewish courts. No, it's not a tragedy, but that linguistic battle is already lost. If I spent my time challenging every person who misuses the word I'd never get anything else done. A while back when a young man was missing in the Toronto waters after a boating mishap a SEGULA came forth of Rabanim going out in a boat and putting pieces of bread on the water. Shortly thereafter the body rose above the surface, enabling Kever Yisroel. Perhaps the same Segula can be used in this case. Nope. You've got his position backwards. His entire point was that the cat CAN'T be both alive and dead, that such an answer is ridiculous, and therefore that there's a serious problem with the Copenhagen interpretation. The rabbis are not making her anything. She IS an agunah until the rabbis can find a heter for her. The fact that you think she should be allowed to remarry without any consideration of the halacha is shocking and disgusting. there have been horror stories of agunahs husbands turning up even when 100% cast iron certain witnesses saw them dead or killed. especially after the holocaust. habias corpus is a nighmare so they must wait until all bodies havbe been accounted for or chas vesholom discounted. Let these Rabbi's act like Rabbonim and make a decision. If we know for sure he was on the plane and we know for sure that there were no survivors then make a p'sak. Don't torture this family and don't add to their tzar. no he is definately alive......you see just as the plane exploded in mid air he jumped out and swam to one of the nearby islands and is awaiting rescue. No, not really. Who's testimony? a Goy? We're not Mecabul (skip the spelling) his edus! Also, just because there isn't any footage of him debarking, doesn't PROVE that he stayed on the plane. “ You speak as if agunah were some modern invention. It's been part of halacha for 3300 years; if we can't prove that the husband is dead then he must be presumed to still be alive. If there is proof that he did board the plane, and didn't get off before takeoff, and that there couldn't possibly be any survivors, then the beis din will permit her to remarry; otherwise they can't. Hagadol Millhouse, is a get given in exchange for money a valid get? Is that the purpose of kedushin and erusin? To be unwound by money?? Also, how do you come up with 3300 years?? “ No, not really. Who's testimony? a Goy? We're not Mecabul (skip the spelling) his edus! Who told you we don't accept his testimony? And yes, if there is continuous footage from when he boarded until the plane took off, and he's not seen coming out of the door again, then we know he was on board. Who told you we don't accept his testimony? If he jumped out from that height, then he's dead. The only real question is whether he was on the plane in the first place. “ Hagadol Millhouse, is a get given in exchange for money a valid get? Is that the purpose of kedushin and erusin? To be unwound by money?? Yes, a get given in exchange for money is certainly valid. There is not even a question about that. Let's get something clear. Ruling if this woman is an agunah or not is not just tied into her ability to remarried. She is at least partially hindered from the greiving process while this decision is (I hate to say) still in the air. The reality, if you have been reading the news on this plane incident-which I have, is grim. The plane flew directly into a tropical storm over the middle of the ocean. They have mentioned that the plane seems to have broken up in the air and then crashed. They have mentioned that maybe the plane was struck by lightning. If someone was still alive *in* the ocean, they likely would have been struck by lightning or drowned. Incidentally, these comments about how he may be alive are kind of disgusting. #36 Yitzhok, you suppose that he got off the plane while it was in the air? That is what it sounds like. Let me close by saying that this is such an unfortunate tradgedy. I sincerely hope that Hashem should comfort this woman and the children, as well as the man's other relatives, friends and co-workers. As nowadays the boarding procedure requires a photo id, if the French Jew is on the plane's manifest, rest assured he was on the plane, and is now very much, deceased. To be matir an aguna is a very serious thing. You can be sure that the Rabbanim want just as much as anyone to finalize her status and allow her to mourn and remarry. But they must do their due diligence according to Halacha. If a someone is declared dead, and his wife remarries, and then he turns up alive (it has happened in some fascinating cases) then the children are Mamzerim. It is worse for everyone. Let them do their job and leave out the peanut gallery comments. There is a reason whey THEY are in their position and not you. If he was indeed on this Flight 447, then he's definetly Dead R"L .There's no way, that a person can survive from a plane in this situtation, & therefore i feel she's a Widow. Yes i also say a thourough check has to be done, such if you can check on the camerawhen he boarded the , also if his name was indeed signed in at the airport. If you are indeed a "poisik" and giving a heter for this agunah, don't you think it would be prudent to give your name so she can present the heter when needed? “ A yashar koach to Milhouse (#21) for correctly exposing the fraud of most of the so-called "agunos" today. Just because a woman is involved in a nasty divorce conflict in no way confers on her the status of "agunah". We need to have rachmonus on the children who would be born from an illicit union , R"L. It works both ways. The pillars of our nation will decide what needs to be done here. In most cases the 'husband' needs the money to pay for a mental health team to help him deal with unresolved issues of guilt stemming from their preference for yener to'aivoh instead of marraige. Would it really bother ou so much if there was one less agunah suffering in the world? Is your hatred of all things female really so deep? He started counting from the first time he was upset at his wife. You are so busy mouthing off about the evil ways of women every time anything that looks like a skirt comes within a mile of you I find it hard to believe you have ever gotten anything done anyway. “ You are so busy mouthing off about the evil ways of women every time anything that looks like a skirt comes within a mile of you I find it hard to believe you have ever gotten anything done anyway. Please point to a comment or two I've made about "the evil ways of women". Liar. “ Would it really bother ou so much if there was one less agunah suffering in the world? Another moron heard from. What has this got to do with hatred of females? Are you projecting or what? Huh? How does that answer anything? You made a factual claim; it's up to you to explain how you know it to be true. Have you boarded this flight before, or similar flights at that airport, that you know the procedure so well? When was the last time you posted anything on VIN without getting into a nasty arguement? Maybe that is why you had such a bad marraige, you simply cannot get along with the human race (especially the female half of it). “ When was the last time you posted anything on VIN without getting into a nasty arguement? When's the last time you did? Of course, since you're a coward who posts anonymously, we'll never know. And yet another moron heard from. What makes you so sure I "had such a bad marraige"? First people seem to think they know where I live (though they can't agree on a single location); now they think they know something about my marriage! You don't even know whether I'm male or female, you idiot, let alone how many times I've been married or how any of those marriages may have gone. You sound like a cross between Mark Levin and Oscar the Grouch. Except unlike you or Mark Levin, Oscar the Grouch at least offered some entertainment value. What difference does it make if you are a man or a woman? You obviously weren't much of a husband or you wouldn't have lost your shirt (or blouse, whichever you prefer at the moment) to a better divorce lawyer than you could afford to handle your side of the case. I only know about you that which you advertise about yourself every time the subject of anything female is mentioned. Mentioning the word 'woman' near you is like waving a red cape in front of a mad bull. It doesn't take much to figure out that you are suffering from an inability yo relate to any woman as an equal, a human being created by Gd for a specific purpose. Anyone who responds this way to every mention of anything to do with the female half of the human race is certain to be heading into, in the middle of or at the final flop of a string of failed relationships.